Sandra Villarreal places a flower design next to a Spanish phrase on a shirt before adhering it with a heat press Monday, May 8, 2018, in McAllen. Sandra Villarreal, 32, points to a map in her studio of the United States and Mexico with a few European countries drawn in at her McAllen home. The shaded areas represent places she’s shipped shirts, handbags and caps purchased from her online store. Verbiage taps the Tex-Mex zeitgeist, often inspired by experiences and anecdotes Rio Grande Valley residents might sympathize with. 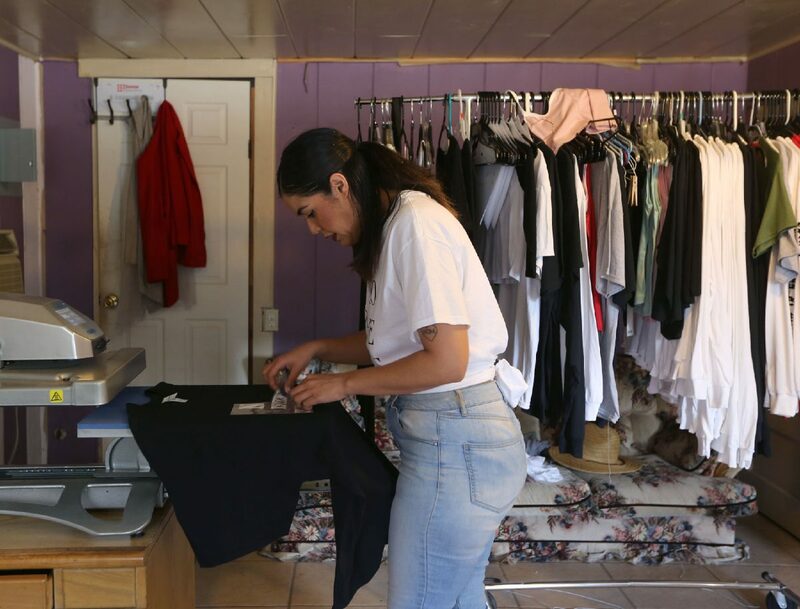 Sandra Villarreal places text on a shirt while making one of her designs with a clothing rack filled with her shirts behind her in a small home workshop Monday, May 7, 2018, in McAllen. Villarreal said she currently has about 30 designs that she has created. Despite this, most of her customers aren’t local. Currently, her biggest markets are in California, Illinois, New York and in larger cities in Texas. She’s also sent items to France and the United Kingdom. Her website boasts images of models wearing her attire, and each item is made per order. One week she could have a dozen orders, and in the next have over 100. “I’m taking a break right now,” Villarreal said. Though, a “break” to her is just abstaining from posting on Instagram for a few days. She still had eight orders to get done. Her last break was interrupted by an Instagram post by Jessica Pimentel where she’s wearing Villarreal’s “Pinches Haters” shirt. When celebrities tag her on posts, it usually spurs a wave of orders, Villarreal said. Though it’s great for her as a business owner, she admits days like those can get hectic. That’s usually how it goes, Villarreal said. 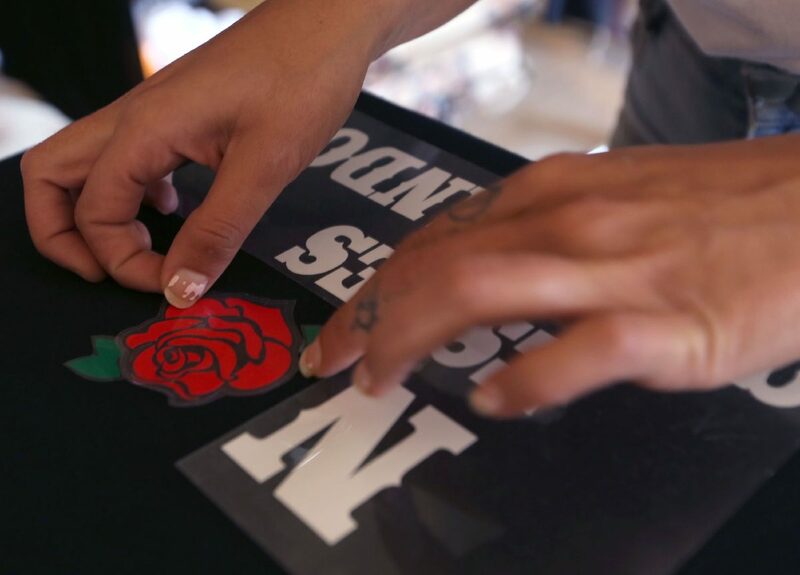 She tries to make shirts that underrepresented groups, particularly women and border residents, might find relatable or empowering. “I want people to just walk with pride and remember that that’s part of you. Whether you like it or not,” Villarreal said. Another of her shirts reads “Callejera ” and another reads “Pocha ”— both are words Hispanics don’t typically use to express pride, she said. Her business’ namesake, and the shirt that started it all, was a red “Make Salsa Spicy Again” T-shirt, that sports an eerily similar design to President Donald Trump’s campaign logo. The campaign, and now the current administration, has continued to use the similar rhetoric that’s put communities like the Valley at the center of attention. Because of that, Villarreal feels it’s important now more than ever to highlight the work border residents like her are doing.